SACRAMENTO, Calif—Tina Campbell doesn’t normally cry when watching performances. But the performance she saw on Jan. 13 at the Sacramento Community Center Theater was an exception. “Loved it … so very emotional,” she said. Mrs. Campbell and her husband and Eddie saw Shen Yun Performing Arts, the world’s premier classical Chinese dance and music company, during its three-day run in Sacramento. “She had some tears, she actually broke down at a couple of points,” said Mr. Campbell. “The dancers, the singers, the orchestra, is just fantastic,” he added. Mrs. Campbell is Chief of Human Resources at the State of California’s Employment Development Department, and Mr. Campbell is retired iron worker. The two attend many different performances, Mr. Campbell explained. But Shen Yun, with its presentation of classical Chinese dance and music, was something special. “This is one of our favourite ones we’ve ever been to. We’re really enjoying it,” Mr. Campbell said. 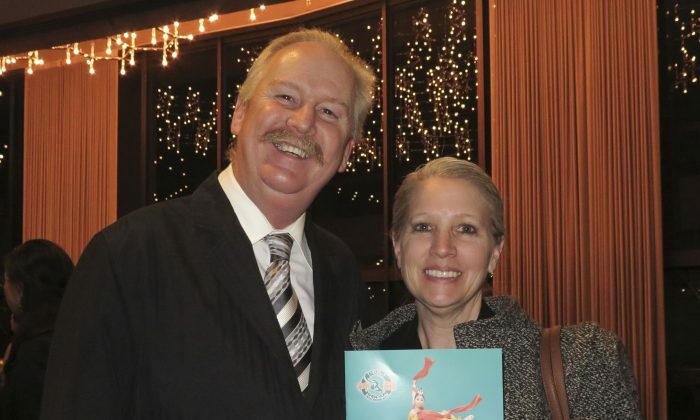 The couple both enjoyed the visual beauty and artistry of Shen Yun. But for them, they said, the performance was also an opportunity to lean about another culture and the lack of freedom in China. “How fortunate we are and how people take it for granted, for me I think I was just overwhelmed,” she said. Based in New York, Shen Yun enjoys artistic freedom, and can freely present its breathtaking performances that revive China’s ancient culture. “The way they’re able to express the culture and the ancient beliefs, she was caught up in it,” said Mr. Campbell. “I’m normally the emotional one in a sad movie. And tonight, I look over and see her, literally, tears coming down, she was moved, it really blew me away,” said Mr. Campbell.